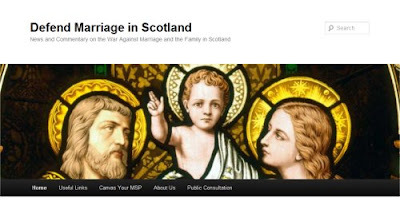 The recently started blog Defend Marriage in Scotland is subtitled "News and Commentary on the War Against Marriage and the Family in Scotland". In particular, they invite you to canvass your MSP. This is a good use of blogging for a particular and important issue. If you live in Scotland, this is an essential blog for you. If you live in the United States, it may be of interest to see what's coming your way some time soon.